BLACK is one of the classiest colors out there and this is the reason that it is a favorite color for many. If you are not into bright hues, black is probably already your go-to color. Whether it is casual wear or formal wear, black is seen in abundance. Black has to be one of the most liked formal wear colors for any occasion. 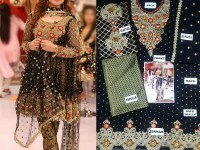 However, black wedding dresses in Pakistan for wedding wear is still something new. Usually, weddings in Pakistan are associated with some of the brightest colored wedding dresses you can find. With those deep reds, bright yellows, greens and blue, black seems like an underdog for the weddings. Where the majority of the crowd is following the vibrant hues bandwagon for the weddings, no one can stop the black lovers from wearing black even at wedding events. Whether it is a beautiful silk black saree, a pretty black maxi, black sharara or a black gharara that will mesmerize anyone, there are endless ways you can wear your favorite color to a wedding in Pakistan. A little while back, the wedding of famous actress Zara and model made the news. What was bigger than a celebrity wedding, was her choice of color for the Valima dress. She looked eternally gorgeous in a black and gold colored dress for her reception. However, there were a lot of discussions held on her choice of color, where a lot of people did love her for choosing a unique color for her black wedding dress. Alongside Zara, her husband Asad also wore a matching black suit and a lot of other celebrities that attended the function were in black too. Designers have been introducing all black wedding dresses, and black bridal dresses in contrast with other colors for a while now. However, it is still an intimidating color for many to wear on their big day. With trends changing, we see a bright future for black dresses in Pakistan for bridal wear for Pakistani women. Black does not have to be a color in weddings that is suitable for the guests only. If you are a bride to be, you now have the option to go with the flow and choose a rich bright colored dress to look like a traditional beauty or make a statement by turning all heads in a lovely black bridal attire. 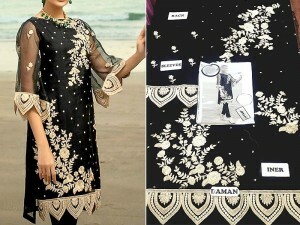 PakStyle.pk is a leading source of Pakistan that provides facility for online shopping in Pakistan and offers great assorment of Black Pakistani Dresses for wedding at affordable prices with Free Home Delivery nationwide. 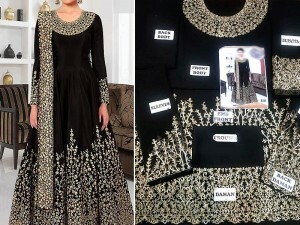 Whether you are looking for black wedding lehenga, black wedding gharara, black wedding ghagra or black wedding maxis, PakStyle.pk is the ultimate one-stop shop for all your bridal shopping needs!